The 2nd to smallest of our floating islands, ipo200 & ipo250 are small enough to use in a small koi pond with limited space, but large enough to support a basking turtle or floating garden. The 2.5 foot x 3 foot mini floating island comes in 2 standard shapes – kidney and rectangular models (IPO 200 & IPO 250). Each of these floating island models are manufactured with individual planting pockets and can be planted with your choice of aquatic or terrestrial plants. From the moment your BioHaven® is placed into the water, even prior to adding plants, our bio-matrix (proprietary design) kick starts the water treatment process through microbial activity. This is not just another versatile floating pond planter, we recognize the need for clean & clear pond conditions, a healthy pond is a happy ecosystem. BioHaven® is a trusted brand modeled after nature. 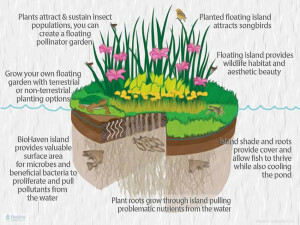 By working with nature, BioHaven® floating water gardens work to transform a polluted-unhealthy water body into a thriving ecosystem…all without the use of chemical treatment. Why buy a floating island? BioHaven® performs better than any floating planter on the market, we provide a concentrated wetland effect unlike any other product. Plants will grow through the island and into the water, island will look like a natural part of the environment. BioHaven® floating water gardens can be launched in shallow or deep water & will fluctuate to changing water levels. IPO 200 & 250 models are small enough to be used in container gardens & small koi ponds. Grow plants using different methods, such as hydroponic, aquaculture, or regular gardening. and jute cover for UV protection. Due to size, the IPO 200 & 250 models are not intended for heavy weight loads. These islands are slightly thinner than IPO300 & up. If you plan to use the floating island for habitat, or waterfowl nesting, we suggest going with a larger model such as 5×4 foot and up. 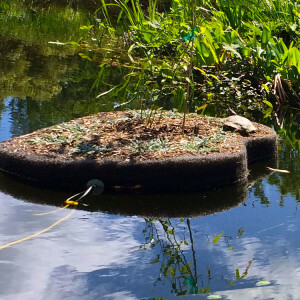 "My floating island arrived yesterday & the turtle immediately began using it! Thank you very much=) "